That is some serious stubble. Wonder if he will be sporting a beard and mullet by Christmas? The stubble is okay, but if a beard is allowed to emerge, I'm boycotting McCartney. I was more concerned at your desire to physically hurl our George fans at Holey as if they were javelins or shot putts! 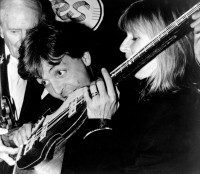 Fomer Beatle Paul McCartney bites into a 4-string bass guitar cake during a luncheon at Claridge's in London, England, Tuesday, Dec. 20, 1989. 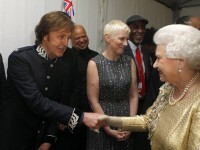 McCartney received a Performing Right Society Award, held by an unidentified man at left, in recognition of his unique contribution to British music. At right is Linda McCartney. Yum. And I don't mean the cake. Paul, Linda and David Gilmour at Knebworth concert 1976. I'm Necko. I'm like Ringo except I wear necklaces. I'm also ewe2 on weekends. Most likely to post things that make you go hmm... 2015, 2016, 2017. Paul is definitely making a Return To Pepperland there! It's the dodgy 'early 67 moustache all over again. I love the moustache. Am I the only one? It is perfect and beautiful in my eyes. But Paul is always perfect to me. And my bird can't sing......!! although I'd have to agree, not Paul's best look there. That's one of those few weird photos where Paul doesn't quite look like himself. And there's Abe in the background. This picture makes me feel warm and fuzzy all over.